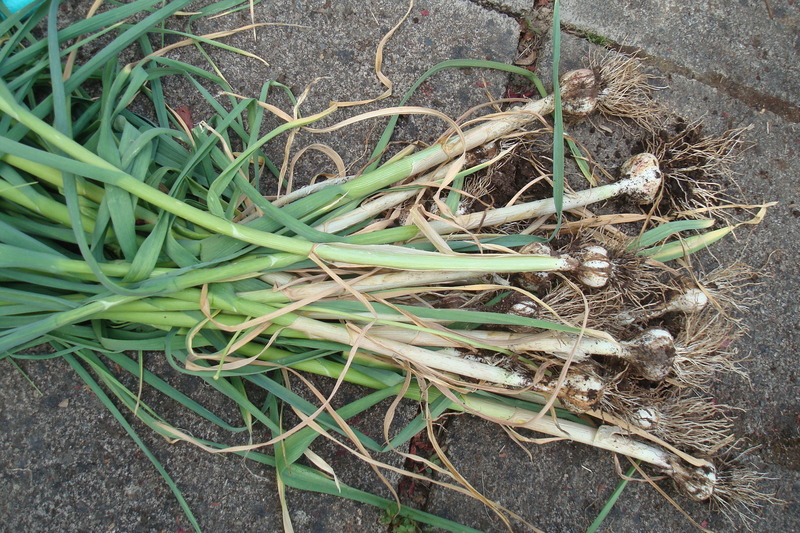 Garlic from the garden, harvested before we left on the 4th of July: delicious, antiseptic medicine. The offending Kani Salad with Heart of Palm and Mango. I mean, who orders that? Can't you just see the vomit-inducing bacteria on the pink, less-than-fresh pieces of imitation crab? During this second summer hiatus, there’s so much food I consumed and want to tell you about: smokey barbecued ribs and craft beers in Asheville, N.C.; farm fresh micro-greens and local fruit juice pops at the tiny Penn Park market in Charlottesville, Va.; corned beef and pickled tongue sandwiches with health salad (kosher slaw) and half-sour pickles at Ben’s Deli in Queens; and most memorably the alluring foods we encountered on our recent trip to Brazil: the pillowy, ubiquitous pao de quiejo, the tropical fruit sucos, the pork part-studded feijoada chased by candy sweet-tart capirinhas; the melt-in-your-mouth rare rounds of rump roast (picanha) carved table side at a fine churrascaria steakhouse; the cold agua de coco sipped from machete-lopped young green coconuts along the wide beaches in Rio. Sopa De Ajo (Con Flor De Calabaza if you have them): Mexican version of Jewish "penicillin" soup, a soothing and light dinner on the night we returned. 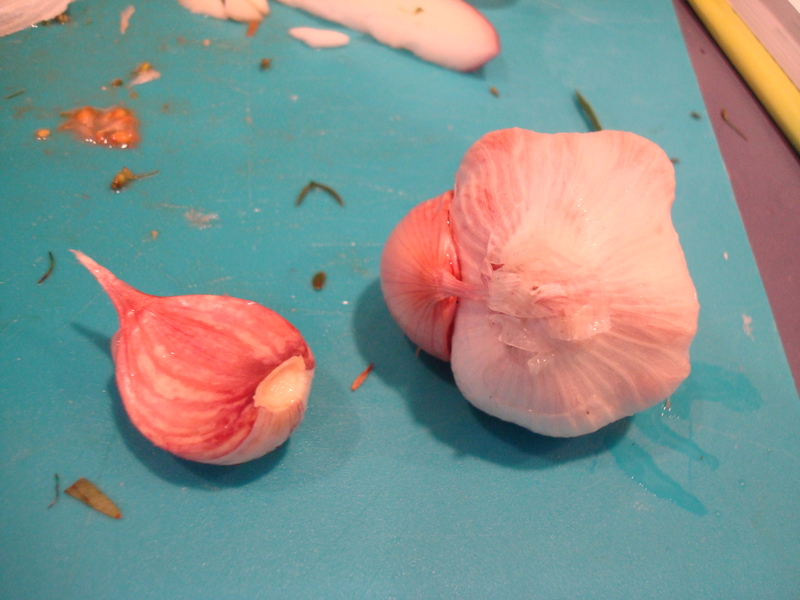 When has garlic, like this soft-neck bulb from my garden, ever let you down? But unfortunately food poisoned me that final afternoon in Rio. To make matters worse, the offending meal wasn’t even memorable. I should have realized the imitation crab sticks in my salad (which I don’t even much care for) tasted less than fresh. After a trip of magical meals, the restaurant in question was forgettable, a nondescript Portuguese-Italian cafe with a yellow awning on Avenida Ataulfo de Paiva whose name I can’t remember, just down the road from the excellent Jobi (if only we’d lunched there one more time instead!). The draw of this nameless cafe on our last day was the outdoor seating. 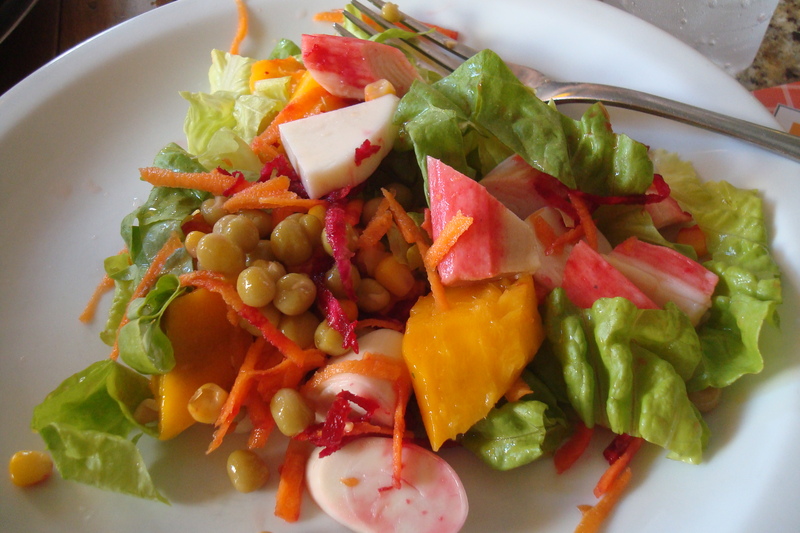 And after a week of heavy eating, I craved salad, even though some members of our party avoided raw veggies, given they chance they were washed in less than perfect water. 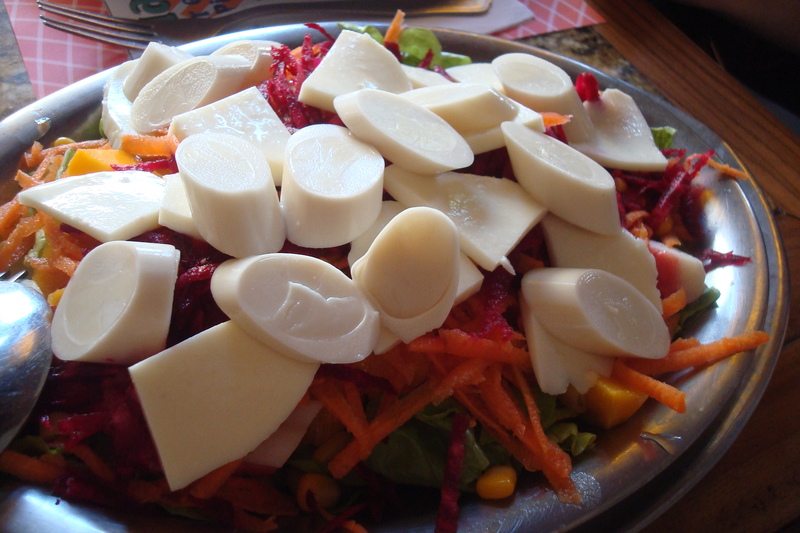 Two salads with “kani” and that ubiquitous heart of palm caught my attention. “What’s ‘kani’?,” we asked the waiter, in butchered Portuguese. He returned with a pathetic-looking crab stick on a plate. So why did I spring for the “Salada de Kani com Manga”? The other ingredients appealed to me. Heart of palm, mango, buffalo mozzarella from the water buffalo they actually have in Brazil (not as good as the Italian variety, though), lettuce, corn, peas. The salad was unfortunately bland, with a plan olive oil and white vinegar dressing. I ate most of it anyway. Dan ate a tad of it, but avoided the now-suspect kani. Why didn’t I trust my instincts? The poisonous salad, before tossing. A little over an hour later, my stomach cramped up. I didn’t even connect the pain with the salad at first. I had a spot of lichi-flavored, probiotic-rich frozen yogurt (the stands are popular on Rio’s trendy streets). Then we shared just one last acai shake (blended with banana) while Dan ordered a sandwich for the airplane. Little did I know I would soon throw this all up in the bathroom of Rio de Janeiro’s surprisingly sparse international airport. That evening there, as we waited several hours for our overnight flight out to Atlanta, the stabbing cramps came in painful waves. I doubled over and squatted to contain the pain, as if almost in labor. Clutching the toilet, I whimpered on the floor of the public restroom, unaware of my surroundings. Luckily, I seemed to get much of the poison out just before our flight. I drank Coca Cola and gulped down some Pepto, ibuprofen and against my better judgment, some anti-biotic Flagyl given to Dan as a last resort from some upstanding Continental Airlines pilots. I discontinued the meds after three doses, per my father-in-law’s recommendation, but they seemed to help at the time. Hell, I would have taken morphine or heroin or anything that wouldn’t kill me, as delusional as I was with pain at that point. Given my symptoms the Delta crew didn’t want to let me on the flight, but the prospect of spending the night in a grungy hotel (or worse, hospital) near the airport seemed unbearable. I somehow rallied just before the flight. I held a hot water bottle against my sore belly and Dan soothingly massaged it throughout the flight. In about 24 hours, I was mostly better, with some residual soreness/trapped gas deep buried deep in my abdomen. 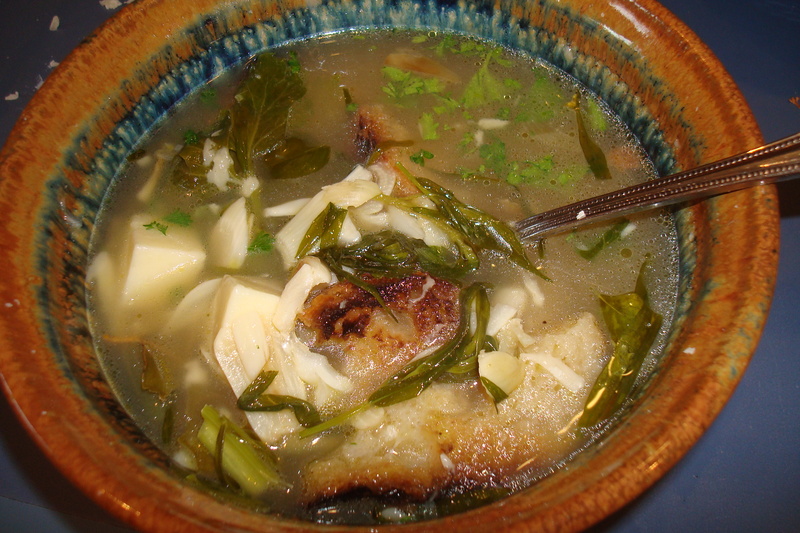 When we returned home, I made a cleansing Sopa de Ajo recipe with two heads of fresh garlic from my garden, a recipe we learned from the excellent Seasons of My Heart cooking school in Oaxaca. It’s rumored to protect against stomach trouble:) I’ll make it again with flor de calabanza if I find these zucchini blossoms at the market! 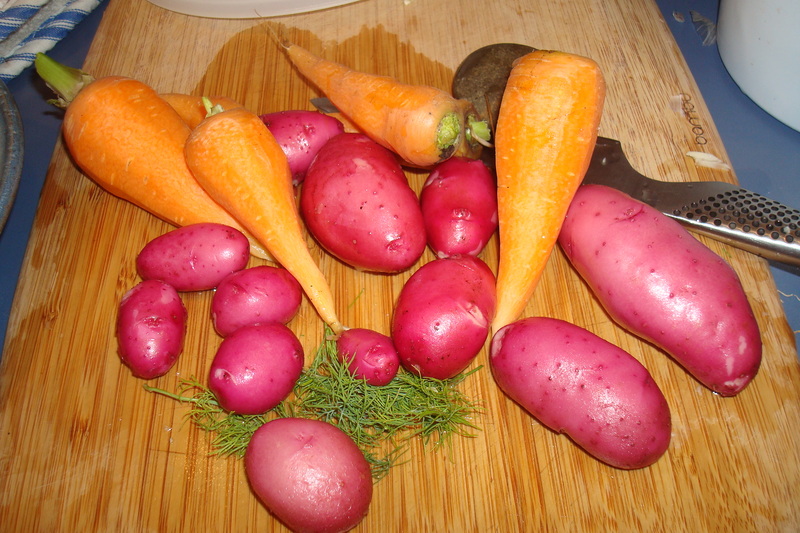 I returned home to uncover carrots and new potatoes in the garden: simple, trustworthy foods for a burned stomach. How thankful I am for my health. And once again, this adventurous eater is chastened. The acrid horse chestnuts, the rabbit kidneys and now this suspect salad. When will BaltimOregon learn her lesson? Food, which is such a vehicle for pleasure for me, can also be poisonous. I now vow to eat more cautiously (but no less enthusiastically) in the coming year. Eating isn’t sport. Maybe this new mindset will help me finally shed that weight I’ve accumulated these past few years as well. How to diet without really “dieting”? Portion control, I suspect. Stay tuned. Good god, girl. Eating *isn’t* sport. You’re absolutely right to focus on choosing better food in the future.